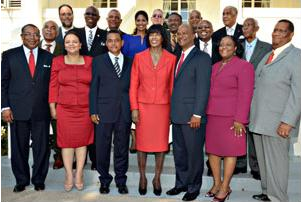 The Cabinet of the Government of Jamaica is the principal instrument of government policy. It consists of the Prime Minister, and a minimum of thirteen other Ministers of Government, who must be members of one of the two Houses of Parliament. However, not more than four members of the Cabinet may be members of the Senate. The Minister of Finance must be an elected member of the House of Representatives. 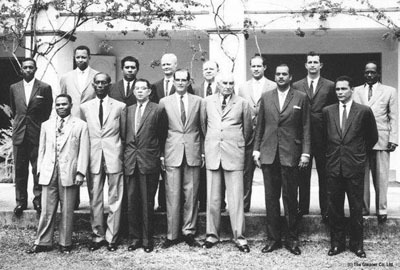 Front Row l-r: Edwin G. Allen, Robert Lightbourne, , Donald Sangster, Kenneth Blackburn, Prime Minister Alexander Bustamante, DC Tavares, K. Jones. Back Row l-r: R.A. McNeil, Hugh Shearer, Andrew Hill, J. Gyles, N. Ashenheim, H. Eldermire, Edward Seaga, L. Newland. Seventh Prime Minister: The Most. Hon. Portia Simpson Miller, O.N., M.P.